Ralph Webster Yarborough (June 8, 1903 – January 27, 1996) was a Texas Democratic politician who served in the United States Senate from 1957 to 1971 and was a leader of the progressive or liberal wing of his party. He was the only Southern senator to vote for all civil rights bills from 1957 to 1970, including the Civil Rights Act of 1964 and the Voting Rights Act of 1965. Yarborough was known as "Smilin' Ralph" and used the slogan "Let's put the jam on the lower shelf so the little people can reach it" in his campaigns. Born in Chandler, Texas, he practiced law in El Paso after graduating from the University of Texas School of Law. He became an assistant to Texas Attorney General James Allred in 1931 and specialized in prosecuting major oil companies. Allred was later elected governor of Texas and appointed Yarborough to a judgeship in Travis County. After serving in the United States Army during World War II, Yarborough repeatedly ran for governor, opposing the conservative faction of Democrats led by Allan Shivers. Price Daniel resigned from the Senate after winning the 1956 gubernatorial election, and Yarborough won the special election to serve the remainder of Daniel's term. He won election to a full term in 1958 and was reelected again in 1964, defeating Harris County Republican Party Chairman George H. W. Bush in the latter race. Unlike most Southern Congressmen, Yarborough refused to support the Southern Manifesto, which called for resistance to the racial integration of schools and other public places. He staunchly supported the "Great Society" legislation that encompassed Medicare and Medicaid, the War on Poverty, federal support for higher education and veterans, and other programs. He also co-wrote the Endangered Species Act and was the most powerful proponent of the Big Thicket National Preserve. Yarborough criticized the Vietnam War and supported Robert F. Kennedy in the 1968 presidential election until the latter's assassination. In 1970, Yarborough lost re-nomination to Lloyd Bentsen, who campaigned to Yarborough's right. He attempted to win the 1972 Democratic primary for Texas's other Senate seat, but lost the primary to Barefoot Sanders. Yarborough did not seek public office after 1972. Yarborough was born in Chandler in Henderson County west of Tyler, the seventh of nine children of Charles Richard Yarborough and the former Nannie Jane Spear. He was appointed to the United States Military Academy at West Point in 1919 but dropped out to become a teacher. Yarborough instead attended Sam Houston State Teachers College and transferred to the University of Texas at Austin. He graduated from the University of Texas Law School in 1927 and practiced law in El Paso until he was hired as an assistant attorney general in 1931 by the state Attorney General and later Governor James V. Allred. Yarborough was an expert in Texas land law and specialized in prosecuting major oil companies that violated production limits or failed to pay oil royalties to the Permanent School Fund for drilling on public lands. He earned renown for winning a million dollar judgment against the Mid-Kansas Oil and Gas Company for oil royalties, the second largest judgment ever in Texas at the time. After Allred was elected governor, he appointed Yarborough judge of the 53rd Judicial District serving Travis County, the county seat of which is Austin. Yarborough was elected to a four-year term later the same year. Yarborough's first run for state office resulted in a third-place finish in the Democratic primary for state attorney general in 1938 against the sitting lieutenant governor. He served in the U.S. Army during World War II after 1943 and achieved the rank of lieutenant colonel. Yarborough was urged to run again for state attorney general in 1952, and he planned to do so until he received a personal affront from Governor Allan Shivers who told him not to run. Texas Secretary of State John Ben Shepperd resigned in the spring of 1952 and was elected attorney general that year. He served two two-year terms. Angered at Shivers, Yarborough ran in the gubernatorial primaries in 1952 and 1954 against the conservative Shivers, drawing support from labor unions and liberals. Yarborough denounced the "Shivercrats" for veterans' fraud in the Texas Veterans Land Board of the Texas General Land Office and for endorsing in 1952 and 1956 the Republican Eisenhower/Nixon ticket, instead of the Democrat Adlai Stevenson of Illinois. Shivers portrayed Yarborough as an integrationist supported by communists and unions. The 1954 election was particularly nasty in its race-baiting by Shivers as it was the year that Brown v. Board of Education was decided, and Shivers made the most of the court decision in order to play on voters' fears. Yarborough, however, nearly upset Shivers. In 1956, Yarborough made it to the primary runoff for governor against U.S. Senator Price Daniel. Texas historian J. Evetts Haley ran in the primary to the political right of both Daniel and Yarborough but polled few votes. After being endorsed by former opponent and former Governor W. Lee O'Daniel, and making aggressive attacks on the Shivers-backed candidate, Yarborough looked to win the runoff, but instead he trailed Daniel by about nine thousand votes. It is believed (by Yarborough, his supporters, and biographer) that the election was stolen because of irregular voting in East Texas and that Yarborough really won the runoff by thirty thousand. Nevertheless, Yarborough's runs for governor had raised his stature and popularity in the state as he had been campaigning for six straight years for office. When Daniel resigned from the Senate in 1957 to become governor, Yarborough ran in the special election to fill the empty seat. With no runoff then required, he needed only a plurality of votes to win. Ironically, his many runs for governor made him the best positioned candidate. Yarborough won the special election with 38 percent of the vote to join fellow Texan Lyndon B. Johnson in the Senate. The runner-up in the race with 30 percent of the vote was U.S. Representative Martin Dies, Jr., known for his investigations into communist infiltration. A Republican lawyer from Houston, Thad Hutcheson, ran third with 23 percent of the ballots cast. James Boren served as Yarborough's campaign manager and chief of staff. In office, Ralph Yarborough was a very different kind of Southern senator. He did not support the Southern Manifesto opposing integration and supported national Democratic goals of more funding for health care, education, and the environment. Himself a veteran, he worked to expand the G.I. Bill to Cold War veterans. Yarborough's first major legislative victory was the successful passage of the National Defense Education Act of 1958, which began federal funding of loans and grants to universities and their students. In 1958, Ralph Yarborough easily defeated in the Democratic primary the conservative William A. Blakley, a millionaire businessman from Dallas, who was backed by Yarborough's long-time party rival, Governor Daniel. Blakley had been the interim senator from January to April 1957 but did not run in the special election in which Yarborough defeated Dies and Hutcheson. Instead Blakley was appointed senator again in 1961 and ran in another special election, only to be defeated by the Republican John Tower. In the nationally Democratic year of 1958, Yarborough cruised to victory in the general election over the Republican nominee, publisher Roy Whittenburg of Amarillo. In 1962, Whittenburg ran unsuccessfully for governor in the Republican primary against Jack Cox of Houston, who would in turn lose to Yarborough's intraparty rival, John Connally. During his first full term, Yarborough worked for a bill signed by President John F. Kennedy to designate Padre Island as a national seashore. Yarborough rode in the Dallas motorcade in which John F. Kennedy was assassinated on November 22, 1963. He was in a convertible with Vice President Lyndon B. Johnson, Lady Bird Johnson (who sat between Yarborough and Johnson), United States Secret Service agent Rufus Youngblood, and Hurchel Jacks of the Texas State Highway Patrol. From the start of the President's tour of Texas, Yarborough considered that he had been slighted by some of the arrangements and so, in the early stages, refused to ride with Johnson, despite repeated pleas by Youngblood. His decision, underpinned by a long-standing feud with Governor Connally, an old friend and erstwhile ally of Johnson, caused embarrassment to both the President and Vice President and drew considerable diversionary attention in the press. According to Johnson, Kennedy considered Yarborough's behavior "an outrage" and there is some evidence of a heated exchange between Kennedy and Johnson the night before the President's death. According to Johnson's biographer, Robert Caro, the following morning in Fort Worth, Kennedy intervened directly with Yarborough, making clear that, if he valued his friendship, he would ride with Johnson when the party reached Dallas. Then, during the short flight from Fort Worth, Kennedy persuaded Connally to give Yarborough a more prominent role in some of the later functions planned in Austin. In the ensuing motorcade, the car carrying Yarborough and the Vice President was two cars behind the presidential limousine carrying Kennedy and Connally (who was seriously wounded during the attack on the President). In a later interview, Yarborough called the event, "the most tragic event of my life." Shortly after Johnson became President, Yarborough telephoned him in conciliatory and supportive terms. In 1964, Yarborough again won the primary without a runoff and went on to general election victory with 56.2 percent in LBJ's 1964 Democratic landslide. His Republican Party (GOP) opponent was future president George H. W. Bush, who attacked Yarborough as a left-wing demagogue and for his vote in favor of the Civil Rights Act of 1964. Yarborough denounced Bush as an extremist to the right of that year's GOP nominee for president Barry M. Goldwater and as a rich easterner and a carpetbagger trying to buy a Senate seat. It has since been learned that then-Governor Connally was covertly aiding Bush, instead of party nominee Yarborough, against President Johnson's wishes, by teaching Democrats the techniques of split ticket voting. In the same election, Connally easily defeated Bush's ticket-mate, Jack Crichton, a Dallas oil and natural gas industrialist. In 1967, Yarborough was the first U.S. Senator to introduce the first bilingual education act. Although Yarborough supported Johnson's domestic agenda, he went public with his criticism of Johnson's foreign policy and the Vietnam War after Johnson announced his retirement. Yarborough supported Robert F. Kennedy until his assassination, then supported Eugene McCarthy until his loss in Chicago, and finally backed Hubert Humphrey for President in the pivotal campaign of 1968 against Nixon. 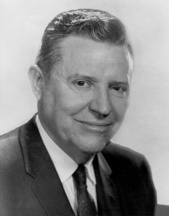 In 1969, Senator Yarborough became chairman of the Senate Committee on Labor and Public Welfare. In 1970, South Texan businessman and former Congressman Lloyd Bentsen won a 54 to 46 percent upset victory against Yarborough in the Democratic primary, when Yarborough was focusing on the expected second general election again against Bush. Bentsen played on voters' fears of societal breakdown and urban riots and made an issue of Yarborough's opposition to the Vietnam War. Bentsen said that Yarborough was a political antique. Said Bentsen, "It would be nice if Ralph Yarborough would vote for his state every once in a while." Bentsen went on to win the general election against Bush. In 1972, Ralph Yarborough made a comeback effort to win the Democratic nomination for U.S. Senator as a challenger of Republican Senator John Tower, who as a young man had once circulated Ralph Yarborough stickers. Yarborough won the first round of the primary and came within 526 votes of winning the primary without the need for a runoff. Yarborough again made accusations of vote fraud from the conservative wing. He lost in the primary runoff to a former U.S. Attorney, Barefoot Sanders, in an anti-incumbent sweep after the Sharpstown Bank-stock Scandal despite neither being an incumbent nor involved at all with the scandal. Ralph Yarborough never again sought public office. Yarborough died in 1996 in Austin. He is interred at the Texas State Cemetery there beside his wife, the former Opal Warren (1903-2002), a native of Murchison in Henderson County, Texas. The Texas State Cemetery is sometimes called "the Arlington of Texas." Also buried there are Yarborough's old intraparty rivals, Allan Shivers and John Connally. Yarborough left a legacy in the modernization of the state of Texas and achieved political power when Texas had a native son, Lyndon Johnson, in the White House. He was combative with the dominant industries of oil and natural gas and pushed for the petroleum industry to pay a greater share of taxes. Yarborough was one of the last of the New Deal Democrats and powerful liberals in Texas state politics. (He was followed by more conservative senators such as Lloyd Bentsen and Republican Phil Gramm). Yarborough is remembered as the acknowledged "patron saint of Texas liberals." Supporters and former aides that have since risen to prominence include Jim Hightower, Ann Richards, and Garry Mauro. The University of Texas at Austin Press published a biography titled, Ralph W. Yarborough: The People's Senator, by Patrick L. Cox. It features a foreword written by liberal Senator Edward Kennedy (D-MA). The Yarborough Branch of the Austin Public Library was named in Ralph Yarborough's honor. ^ STEPHEN LABATON (January 28, 1996). "Ralph Yarborough Dies at 92; Cast Historic Civil Rights Vote". New York Times. Retrieved 2 August 2012. ^ a b c Archie P. McDonald (April 15–21, 2001). "Liberal Where Liberal Isn't Cool". TexasEscapes.com. Retrieved 2 August 2012. ^ Obadele-Starks, Ernest M. B. (1994). "Ralph Yarborough of Texas and the Road to Civil Rights". East Texas Historical Journal. 32 (1): 40. Retrieved 9 February 2018. ^ "TX U.S. Senate Special Election, April 2, 1957". ourcampaigns.com. Retrieved September 8, 2013. ^ Labaton, Stephen (28 January 1996). "Ralph Yarborough Dies at 92; Cast Historic Civil Rights Vote". New York Times. Retrieved 13 October 2014. ^ Caro, op.cit. Bedell-Smith's account suggests that Kennedy's aide Larry O'Brien spoke to Yarborough, while Congressman Albert Thomas persuaded Connally to include Yarborough in the programme for Austin (op.cit.) In any event, Kennedy appears to have been frustrated with Johnson's apparent inability or unwillingness to knock heads together (Caro; Bedell-Smith). ^ Warren Commission Hearings, vol. II Warren Commission Testimony of Rufus Youngblood March 9, 1964. Accessed January 3, 2013. ^ The Witnesses: Sen. Ralph Yarborough on YouTube Accessed January 3, 2013. ^ San Miguel, Jr., Guadalupe (2004). Contested Policy: The Rise and Fall of Federal Bilingual Education in the United States 1960-2001. Denton, TX: University of North Texas Press. pp. 14–15. ISBN 1-57441-171-3. United States Congress. "Ralph Yarborough (id: Y000006)". Biographical Directory of the United States Congress.